Something just seemed so…fishy about this place and yet Chesha couldn’t quite put her finger on it. After all standing outside it was hard to put a finger on anything creating those delicious smells cocooning the building. The place practically brandished a shield against unsavory scents, a few pipes up top spewing smoke saturated in delicious meats, stews, and other little goodies that left the seriously contemplating girl a little drooly. All the downturned eyebrows and crossed arms of the world couldn’t diminish the delightful aura of the place as smiling people entered, and forced another wave of wondrous smells on the girl. Buffets usually struck Chesha as “too good to be true” as they held some of the more annoying rules. One could stuff their face to their delights. Unfortunately “to go boxes” not only didn’t exist, but were prohibited at these sorts of places. You couldn’t finish that plate at a later date unless you basically waited there a few hours (hoping not to get kicked out for lack of eating) and finish it then. If she wanted to bring something back for Xia though it meant a bit of subterfuge. Although Xia knew it to be a rule, the woman hardly batted an eye when Chesha returned home with a few boxes of random dishes, figuring that if she opted to break a “silly rule” amidst more horrible ones then she’d been raised well enough. It may not have been white picket fences, but Chesha didn’t hate all of her life either. She’d grown up with a few tricks under her belt, ones her mother could only sigh at, and perhaps those skills gave way to her suspicion senses. Belly growls threatened to reach audible levels, remaining at a whisper for the moment so she could put it off a little longer. The allure of a buffet though sang it’s siren call to her, hands of smoke almost trying to coax her inside and give into desire. Who would make a buffet evil anyways? And how? The escapee’s mind continued its cyclical argument of evil buffets being silly and yet knowing life wasn’t as easy as fiction might lead one to believe. Lurking outside their place any longer might brand her a vagabond, the dark haired girl glaring at the menu in a last ditch effort to stall and talk herself out of going inside. She failed. Again the tinkling of the bell nipped at her ears, having listened to it each time someone entered as she contemplated entering. Eyes remained locked on the woman, enjoying the way her hair curled and yet a little sad to see a lot of it up in a round bun. A pristine white button up shirt hugged her form alongside a black pencil skirt, stockinged feet disappearing into a pair of heels that always fascinated Chesha: how did people stand to wear those for hours on end? The woman bore quite the curves and yet wore them well. The only thing that bothered Chesha was the bright red lipstick, but if the lady wanted that for a bit of flare who was she to judge? 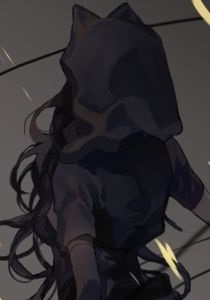 ”Just me I’m afraid.” Hands slipped into the pockets of her thin jacket, hood over her head with stitched on cat ears flopping forward. Despite looking a bit rough and like a kid possibly tossed out on the streets though the woman’s smile didn’t falter in the slightest as she showed her to a table, warning her she might be given a table mate or two since her’s was more or less the only unoccupied table at the time. Even that was purely luck since the people there just left. As the woman took a few used dishes away and assured her a bus boy would be along soon to remove the rest, Chesha eyed the spread just beyond a few booths and tables. The place glowed – naturally from the array of heating lamps – and in her hungry state may as well have held the glow of the Heavens itself. Perhaps it was time to fill up a plate? After all this place may not be evil, the vibe could’ve been a kink in her system or maybe something would go down, but that didn’t mean she wouldn’t make it out of there before then. Alana was going to be serious… she has never really interested into going to places like this. It was a really strange experience, and besides, she was never taken to one before because her grandfather never had the time to take her there. Basically, Alana never had them type of luxuries of buffets and all that sort to go to. Instead, she stayed near her grandfather while he taught her everything that he could, passing on all her knowledge onto the young woman who was now a pilot for Highguard. It was indeed a whole different experience and she was finally doing something that she loved. Letting her feet play chasies with each other as she walked to get into the line, it seemed to be a rather busy place today, although she really cannot say much to go on with that since she has never been there, so it could be busy all the time, she didn’t possess that type of knowledge to go on from that sort of thing, if it was busy all the time though, then clearly, they are doing something right. Oh god, just smelling the food now was great, it was making the female hungry though, that was for sure. Ah well, there was nothing that Alana could really do about it now. The queue got smaller and smaller, thank god. There was just so much going on, and Alana wasn’t paying any attention to it whatsoever… that could possibly be a good thing, while there was a little kid crying and tugging onto his mother's shirt, his mother trying to calm him down. The girls fangirling over something, probably something that doesn’t concern the one eyed female that much, and of course, people eager to get inside the place to have some good food and good drink… Now that Alana thought about it, her stomach was beginning to get very rumbly, this made Alana want some food right now. Finally, the female walked up and was asked if she was just going to be on her own, of course, Alana answered with a resounding yes, she most certainly didn’t bring anyone else with her, and she was pretty sure that nobody had the ability to follow her, she wasn’t that interesting anyway, who else would follow a female that has done nothing wrong or has something that would deem her important enough to do so?? Finally, the female was allowed inside after being explained that she would possibly have to share a table with someone, not that she minded. It just meant that she was going to be able to speak to someone and hopefully have a good time with them, hell yeah. Paradise stretched before the woman’s golden eyes, orbs glittering as if she’d stumbled upon a dragon’s hoard. Perfectly crisped fried chicken, juicy cuts of steak, vegetables sautéed in golden butter, rice steaming and pure – ready to soak up the sauces of anything paired with it, mashed potatoes with sour cream, butter, and many other fixings separating them from foil-wrapped baked potatoes. Another long table housed salad options, large bowls of varying lettuce before one held options of tomatoes, cucumbers, cheeses, boiled egg, croutons, and eventually beyond the multitude of possibilities lay the sauces armed with ladles. Each table held so much wonder and an endless array of choice Chesha could hardly decide where to even begin! Did she start with warm? Fix a small – or large – plate of salad to go with? Maybe she should opt for a bowl of soup instead? Then again the dessert table came with an ever so sweet song with it that she glided by it with a dreamy sigh. More and more tables came into view when passed, noodles from small to large with a variety of sauces, hard shelled tacos and soft tortillas ready with more square containers of fixings, and even from here she could spy a tall pile of pork bao, dumplings, duck, beef and broccoli…’They really let you have a taste of everything here.’ For the briefest of moments she imagined what it might be like if the patrons and staff alike – milling about and replacing containers as they noticed them – spontaneously burst into song and dance. ’Could make for some interesting choreography…’ The only problem there lay in the fact they’d prevent her from getting food and she didn’t fancy being clocked by an elbow or perfectly executed kick. ’I guess I see why they never let us watch such things there. Didn’t want us dreaming silly and pointless things.’ Though she rather enjoyed the notion, but her stomach demanded immediate gratification. Obeying the command of her supreme overlord – underlord? – a pale hand grabbed a warm, white plate and set about doing her best not to make too much of a mountain. It’d be hard though as one thing or another called out to her taste buds, begging her to choose them over everything else. A small cutlet of steak, some chicken, a mountain of mashed potatoes with gravy spilling towards the meats, dumplings, a bao – no two – a single spoonful of spiral pasta she couldn’t name, a bit of sauce for those that oozed to mix with some of the gravy, an eggroll, and a small plate of simple salad greens with tomatoes, white sauce, and spoonful of boiled egg bits on the side. ’This should do for a start at least,’ Chesha tried to convince herself, though at the very least she’d make sure to leave room for dessert. Around then she could worry about sneaking some food into containers and slipping them into her satchel as unnoticed as she could. The final piece de resistance: a bubbly drink. They’d never served such things at the lab and she enjoyed the minor tickle they provided, though always remained careful to treat them like a treat. It kept the taste ever so special to her. By the time she returned to the table it’d been cleaned of the final debris, spotless and almost sparkling under the lights of the place. While they’d warned the girl of possible tablemates she hadn’t been aware of them already informing someone they could sit at the table after it’d been cleaned and they fetched themselves a plate (or few). Slipping into the booth she peered about, noting the locations of people running about to clean up or help less mobile patrons, and set to cutting up the steak a little, scooping half and some of the tower of potato mash into a container. There were a lot of things that well and truly enticed the ebony haired female's eyes, food was everywhere, and there was no telling that Alana could really pick that appeased her appetite… maybe she should start looking for stuff that she really liked, white chocolate?? White chocolate was simply an amazing piece of sweet food that could make her taste buds tingle with absolute delight, what's better to eat than white chocolate?? It was absolutely amazing, she wondered why people thought it was too sickly for them or whatever. Not that it mattered, Alana thought it was the perfect type of thing to go on everything! Cakes, yogurts, even ice cream! Anything goes as long as it wasn’t out of date, because even that would be gross. Turning her head around, she pulled a 180 as she did so. She wondered where she would find her seat, but first… grabbing a plate and putting random food on top of said plate sounded like a fantastic idea, if she must say so herself. It was a buffet for a reason, and buffets were great! You could eat what you want, how you want it! The world of food really was a small one after all, not much a girl can do however. Walking over to one of the tables, she picked up a clean, white plate and glared at the choices available for the girls appetite. There were cakes, crisps, sausages, chocolate, sandwiches. If Alana can name it, they had it! She didn’t waste too much time on picking the food that she wanted, which was just very tasty to resist. What else would she have though once she finishes everything on her plate, however?? After picking what she wanted, she looked to all the tables, and was a bit disappointed to see them full, so she picked the one that looked populess and strided to it, sitting down next to another black haired female. “How do you do? ?” She greeted, she might aswell have some conversation with her in order to keep things professional.